Eight years ago, a staff member at BookPeople approached Steve Bercu with an idea to create a literary day camp for children. 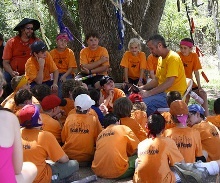 During the summer of 2006, BookPeople held only one week-long day camp with a focus on Rick Riordan’s Percy Jackson and the Olympians series. “We have educational components with mythology being taught by university professors, regular camp activities like archery. In addition, we place a huge emphasis on the books themselves, the literary value and the value of reading,” Bercu discussed. Needless to say the literary camp took off and was a huge success attracting children from all over the country and world. This past summer the store held eight weeks of camp, while this summer they are adding two additional weeks. Along with more camp sessions, John Flanagan’s Ranger’s Apprentice series camp was introduced in 2010 and a Star Wars camp in 2012. The camps allow children to feel as if they are stepping into the pages of their favorite books as they engross themselves in activities described by authors and leave with a new or deeper love for reading. BookPeople was the first and still one of the only stores to have literary camps for children making them always one step ahead as educators and leaders in the bookselling community. “We have just expanded them even more this year. We are now going into partnership with some of the schools in Austin and putting on half day versions of our camps at the schools,” Bercu said.